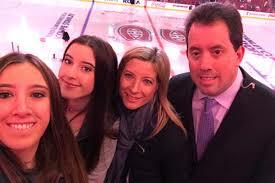 I thought you might enjoy reading the following article about Kenny Albert, son of Marv, which appeared in the New York Post on May 4, 2017, written by Don Burke. And on the 13th day, Kenny Albert rested. Sort of. After doing play-by-play for 12 NHL playoff games over the previous 12 days in five different cities, his first day without a game to broadcast since April 11 was anything but restful. After arriving at his home in New Jersey the night of April 23 from Boston, where he had called Game 6 of the Bruins’ series against the Senators that afternoon, Albert spent a few hours the next morning carving out his travel itinerary for the NHL conference semifinals, where he is again pulling yeoman duty, bouncing between the St. Louis-Nashville series for NBC and the Rangers-Senators matchup for MSG Radio. That was after dropping off his dry cleaning in anticipation of leaving town again the following day, when he was to fly to St. Louis for Game 1 of the Western semis. That afternoon, he attended a memorial service for legendary FOX/SNY director Bill Webb, grabbed a quick dinner with his wife and two daughters, was a guest on two radio shows, did some prep work for his upcoming broadcasts, did an interview, and wrote an article for MSG’s website previewing the Rangers-Senators series. Yep, that’s how Kenny Albert spent his day off. “Sometimes he’ll send me his schedule. I’ll look at it and say, ‘What?’ It’s all over the place,” said his dad, iconic play-by-play man Marv Albert, who knows a thing or two about maniacal scheduling. Forty years ago, Marv, who now works primarily on Turner Sports’ NBA package, broadcast both Knicks and Rangers home games on radio, did the weeknight sports on the 6 p.m. and 11 p.m. news at WNBC, and filled his weekends with an NFL game, a college basketball game or a boxing match. Albert’s streak of 12 games in 12 days — which this week became 16 games in 17 days — is a personal best, but he also had a stretch in January when he did 14 games in 15 days while broadcasting the NFL, the NHL and the NBA. He began doing the NHL conference finals for NBC in 2014. That year the Rangers advanced to the Stanley Cup finals and the next year they went to the conference finals. “I wound up working 12 out of the 13 games in the  conference finals.,” he said. “The next year, there were three games in Anaheim during the conference finals and the Rangers were playing Tampa Bay. “There was a triple-overtime game in Anaheim. It started at 6 [p.m.] local time. … I was going through Miami on the red-eye to make it to Tampa. I made the final red-eye. It left at 1:15 [a.m.] and I actually made it to the morning skate. … People who had watched the game that [previous] night were looking at me funny when I walked into the building. They had no idea how I got there so fast. There hasn’t been a need for any such time travel this time around — at least not yet. During last month’s first round, six of the games the 49-year-old Albert worked went into overtime. He worked with four different broadcast partners, took eight flights, rode once by car from Boston to Montreal, twice from Montreal to Ottawa, once from New York to Boston and twice from Boston to his Bergen County home. On two of those rides, NBC’s NHL analyst, Pierre McGuire — who also did 12 games in 12 days, just not always the same games — joined him. “She’s great about it,” Albert said. “It worked out well this year. My kids [Amanda, 17, and Sydney, 14] were off from school for the first couple of days of this stretch. They were up for Game 1 of the Rangers-Montreal series, so we were able to spend some time, have lunch, explore a little bit. They went to the game that night. It happened last week, around 4:30 in the morning. Albert awoke and, for a good 15 or 20 seconds, had no idea where he was. He was in a hotel room, of course. Isn’t he almost always? But what hotel? What city? What country? It’s an occupational hazard, the kind of thing that happens from time to time. He wisely has taken to snapping cell-phone photos of his room number so he doesn’t head for the wrong door. “Sometimes I still have the room number from my previous stop in my head,” said Albert, who eventually realized he was in Ottawa. “I don’t feel tired during these stretches. I guess the adrenaline kicks in. … You kind of feel tired after the stretch is all over. While it’s going on I think it’s the adrenaline and keeping up with both series and reading all the articles on the off day — which isn’t really an off day for me because I’m working another game. Work clearly is something Albert doesn’t shy away from. He did 39 playoff games in 2014, including 16 in 17 days; 32 the following season, including 13 in 14 days; and 26 last season, even though the Rangers were eliminated in the opening round. With that in mind, Barbara makes sure her husband has his vitamins packed as well as remedies for his throat should he need them. It likely will be mid-June before that even has a chance to happen. No matter how the Rangers fare, Albert will call the Western Conference finals for NBC, and he will be at the Stanley Cup finals, where will do radio play-by-play for Westwood One. His son, who was 5 years old when he began tagging along to games, shares that philosophy.